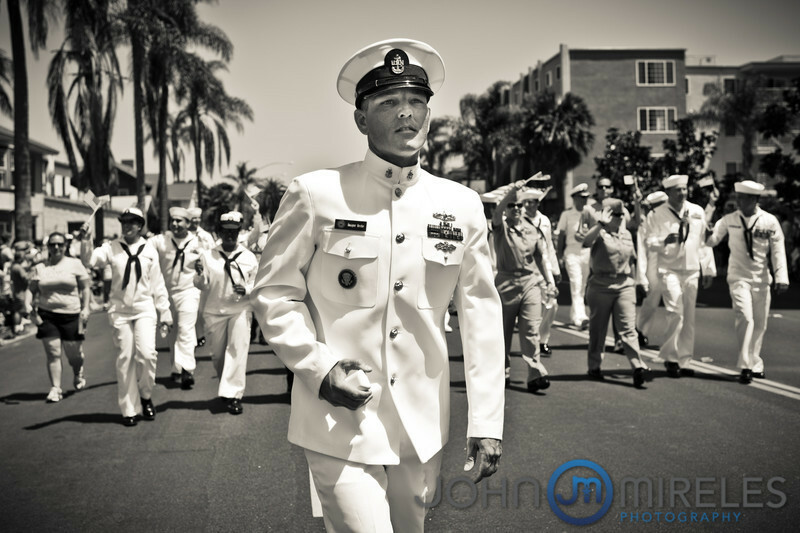 It’s been years since I photographed the Gay Pride parade in San Diego. Usually I have a wedding that weekend so it just hasn’t fit into my schedule. This year, I happened to be free so I pedaled my bike on over the parade route and started snapping away. Without a doubt, the most anticipated moment of the parade was when the soldiers in uniform walked the route. Normally, soldiers are not allowed to parade in uniform unless they have permission, but, because of the heavy military presence in San Diego (we have three aircraft carriers home ported here, a submarine base and two Marine bases) and the fact that gays can now legally serve in the military, the powers that be issued an announcement a couple of days prior that soldiers could attend the parade in uniform. The fact that our fighting men and women would be in uniform at a gay pride event was history enough but then this man walked into my camera’s view. I didn’t realize it that time, but he was on a mission. Notice the little box he’s holding in his right hand. After he passed me, I turned around to find this scene. There in front of hundreds of people, this sailor proposed to his obviously shocked boyfriend. Before I knew it, I found myself swept up in one of the most emotionally powerful experiences of my life. Yes, here was one person proposing marriage (though not yet legal in California) which is a significant and emotional moment to be sure. But against the background of all the civil rights arguments and the fact that, had this man dropped to one knee a year ago, he would have been expelled from the military, the sight literally brought tears to my eyes. It all happened so fast and without warning. I was lucky to have been in the right place at the right time. After it was all over, everyone cheered and the parade continued. My immediate thought was that I’m proud to be an American. I’m proud to live in a country where people can accept each other based upon the intrinsic value of human dignity. Where people are allowed to be different from the norm. Where love can express itself free from the constraints of bigotry and religion. In the photo above, you can see one of the soon-to-be grooms checking out his ring. After they passed me, I let my camera drop and knew that before too long, people would look at my photos and wonder what the big deal was all about. Witnessing his little slice of history made ever more resolute my faith in the fact that this moment will come and in my hope that it comes soon.